In a patent filing published earlier this month, Apple discusses the concept of illuminated touchpads that could improve the overall user experience of certain electronics devices by providing handlers with constant visual feedback. "Although touch pads work well, improvements to their form feel and functionality are desired. By way of example, it may be desirable to provide visual stimuli at the touch pad so that a user can better operate the touch pad," the Cupertino-based electronics maker wrote in the 34-page filing with the United States Patent and Trademark office. For example, Apple said visual stimuli may be used (among other things) to alert a user when the touch pad is registering a touch, indicate where the touch is occurring on the touch pad, provide feedback related to a touch event, indicate the state of the touch pad, and so forth. Backlit touchpads would not only alert the user to the location of the touchpad is in low light conditions, but also to give other feedback related to how the touch pad is being used. 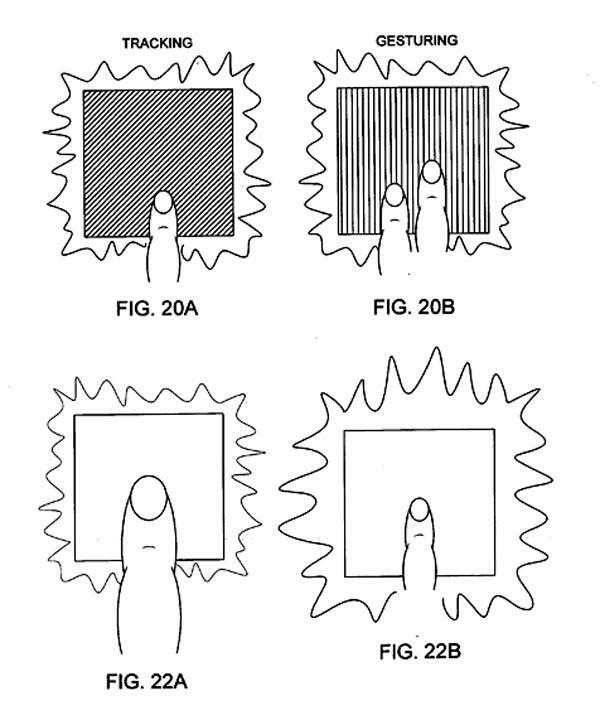 As an example, Apple said such touchpads could possibly change intensity or color based on motion characteristics or pressure, providing an illumination point that follows a finger as it is moved about the touch sensitive surface, showing different states with varying levels of brightness or color. Alternatively, the company continued, visual effects could be used during and after the input event to dynamically indicate characteristics associated with the input events. These characteristics could include 'when,' 'where,' and 'the number of inputs' being made relative to the input surface. "This type of feedback also improves inputting by providing visual cues to the user about the input device" as it is being used, Apple wrote. "Alternatively or additionally, the visual effects may be used before an input event to invoke the user to perform a particular input event at the input surface. This type of feedback also improves inputting by helping the user make appropriate inputs or helping them learn input gestures (e.g., timing, location and movements)." In most cases, Apple said the visual effects (outputs) are linked or tied the input events being performed, and in those cases the visual feedback system should not be considered a separate display. Still, the technology could vary widely. In one embodiment of Apple's invention, the visual feedback system is described as a light based system that illuminates the input surface through light emitting devices that may include one or more light sources and a light distribution system for distributing the light at the input surface. "That is, the input surface can generate glowing special effects that may for example provide backlighting to the input surface and/or provide an outline, trace or shadow of the sensed object on the input surface," the filing states. "The glowing special effects may even indicate a state of the input device as for example when the input device is in a tracking state or gesture state." In one application of the invention, however, Apple indeed describes illuminated touchpads that sport display characteristics. "The visual feedback system may be a graphically based system that generates graphics at the input surface," the company wrote. "LCDs, OLEDs and electronic inks are examples of graphically based systems. These devices however can be cost prohibitive and more complex to implement when compared to light based systems." 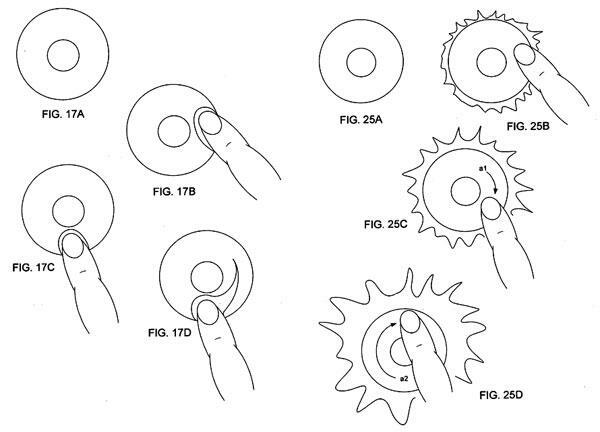 The patent also refers to an implementation where the illuminated portion of an iPod click-where follows the motion of the finger as it is moved across the surface. "The leading edge, body and trailing edge may have different illumination profiles. For example, the leading edge may have a high intensity level, the body may have a medium intensity level and the trailing edge may have a low intensity level." 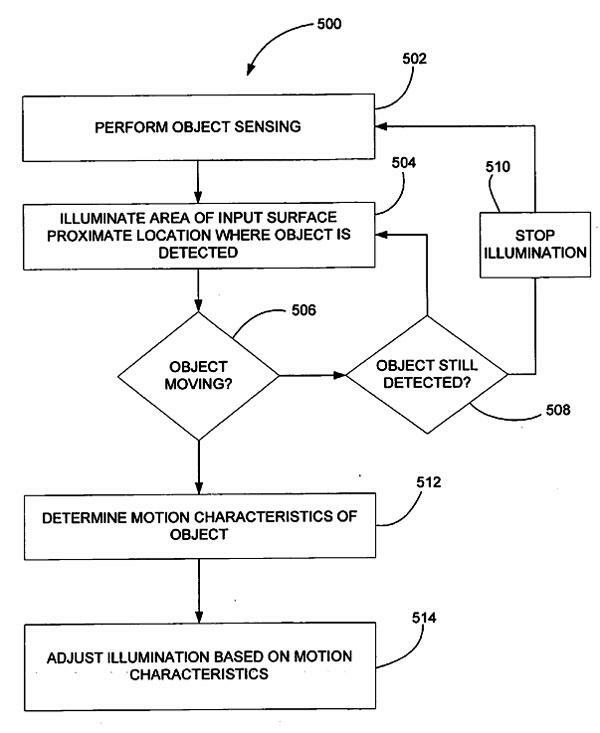 The March 31, 2006 filing, which is credited to Apple employees Stanley Ng and Duncan Kerr, goes to discuss possibilities for illuminated touchpads that could be "used as a timer or clock" or that feature multiple areas that could be illuminated with different illumination profiles at the same time.